Some astronomers specialise in trying to glimpse the farthest reaches of the Universe, whereas other prefer to stick closer to home. Dr Tony Arber, from Warwick University, belongs to the latter group and his research investigates the Sun´s structure by trying to build computer models that emulate its behaviours. He is at present working as a plasma physicist in the new Centre for Fusion, Space and Astrophysics at Warwick University. The idea behind the creation of this new centre is to fuse the talents of astrophysicists with other researchers who are exploring how to confine plasma in order to produce useful fusion power here on earth. Plasma, or ionized gas, is considered to be the fourth state of matter alongside solids, liquids and gases. It is the most common phase of matter with estimates of 99% of the visible Universe consisting of the `stuff´. It even occurs in the vast spaces between the stars, albeit at very low concentrations. Life on Earth is indebted to the hot ball of plasma, known as our Sun. 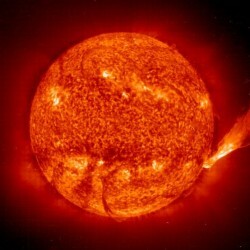 The energy that powers the base of most food chains on our planet comes from the very core of the Sun where temperatures reach over 13 million degrees. In this region that stretches out to about a fifth of the Sun´s radius, high temperatures and pressures allow nuclear reactions to take place that turn hydrogen into helium with energy being released along the way. Above the core, from about 0.2 to 0.7 solar radii, lies the radiative zone. Here energy is transported by being passed along rather like a game of `pass the parcel´ with hydrogen and helium ions being the links in the chain receiving and passing on the `parcel´ of energy. In the next shell from 0.7 solar radii to the `surface´ lies the convective zone. Here thermal cells convect in the same way as a boiling pan of water is constantly churning. Hot columns of material rise and flow upwards and having cooled at the Sun´s surface sink back down again. These convection cells, which average about 1,000km across, can be seen on the surface giving it a mottled appearance. The bright central region where material rises is surrounded by an irregular dark ring, marking the areas where it falls back down to the radiative zone. The top of the convective zone is the Sun´s surface or photosphere, which is a relatively cool 6,000 degrees. Being a big ball of gas the Sun does not have a solid surface and so its surface is defined as being the point where its material becomes opaque. Above the photosphere is what is regarded as the Sun´s atmosphere which has two main layers - the chromosphere and the outer tenuous corona. Although it may appear that the Sun has been thoroughly analysed, there are still many unanswered questions about our nearest star. For example, it is not known why the corona is incredibly hot (200 times that of the surface) or how the solar magnetic field is resurrected after the magnetic poles have swapped. At least we still have some time left to try and find the answers - the Sun is only halfway through its lifetime, being a mere 4.5 billion years old!